This is a 14'-0" 1955 Thompson TVT Super Deluxe Runabout (Catalog Order #346). The specs from the 1955 Thompson catalog read: 14' length, 54" width, 22" depth, weight 250 pounds & capacity 700 lbs. This boat has a factory fiber-glassed hull, glassed from spray rail to spray rail. 1955 was the first year Thompson offered a fiber-glass overlay on their wood halls. I purchased the boat in April of 2002, from a gentleman in Williamston, Michigan, in near mint condition. The pervious owner had replaced an approximate 3'-0" section of the portside rear spray rail along with a couple sections of planking near the transom all of which had dry rotted. I striped and repainted the spray rails as they where not painted the proper Cardinal Red color. I re-varnished the decks and bright work above the spray rail and with four coats of Petite varnish. I also varnished sections of the interior of the hull which where showing a little wear. The vinyl welting on the deck around the padded cockpit openings, also a factory option, was replaced as the original was beyond salvaging. The padding around the cockpit openings and it's vinyl covering are original. She is powered by a 35 H. P. 1957 Evinrude Big Twin manual start outboard. 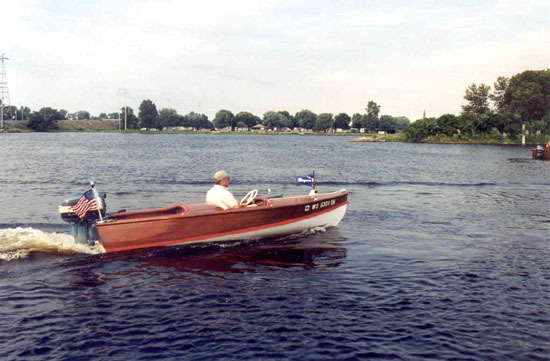 I took this boat to the August 2002 Thompson Rally in Marinette and that is where she had her maiden voyage under her new skipper. I have been told by those people that witnessed it, that with the motor running wide open on the waters at the mouth of the Menominee River and with just myself in the craft, she was riding on only the last couple feet of her hull. It has been all to many years since I have had a good Thompson boat of my own between me and the water and it feels great. I added the running lights, which operate off a 12 volt dry-cell battery, a wood battery box, light switch and some additional deck hardware to dress her out. This summer a windshield will be added using reproductions of the chrome plated cast brass brackets and glass and an original speedometer all of which where typical on boats of that era. Her "Little Sister", the 12 footer of the same model, is sitting in my outbuilding waiting for me the get her restored and on the water also. I am still looking for her "Big Sister", the 16 footer of this same model, when I find her I will then have the complete family of the Thompson Super Deluxe Runabouts. Her Home Port is Appleton, Wisconsin.